I’m not scared to say it: I love a good Subway sandwich. My dad used to take me to the only Subway in town after we went food shopping, and I remember tracking my growth based on how much of the toppings I could see over the tall counter. Now, it seems, Subway wants to ruin that experience for future generations. The global chain of faux-bodega sandwiches announced a flashy restaurant overhaul on Monday morning. It’s called the “Fresh Forward” design, and currently, it’s being tested in 12 locations across the United States, Canada, and the UK. Also, the redesign is bad and wrong. Imagine spending your whole day here, eating and reading the internet and pooping and then eating more and reading more internet. But now, Subway wants to put stupid touchscreen kiosks in its restaurants. They look like the ones you use to get tickets at the cinema, except sandwich-related. Listen to this. You build your order on a smartphone app or kiosk, send it to a work station (which, according to Subway, may be in the backroom) and then a faceless human slaps together the ingredients without you, leaving you pick it up at the counter. Like a zombie! The new ordering process reminds me of that Starbucks app that lets you order and pay for your coffee from your phone. Even then, you usually have to speak to a barista to make sure you’re picking up the right cup bean water. This new Subway situation sounds unusually anonymous and, frankly, uncivilised. The restaurant redesign also includes the addition free wi-fi, USB charging ports, whole tomatoes on display, and a huge new logo glowing on the wall, lording over you. 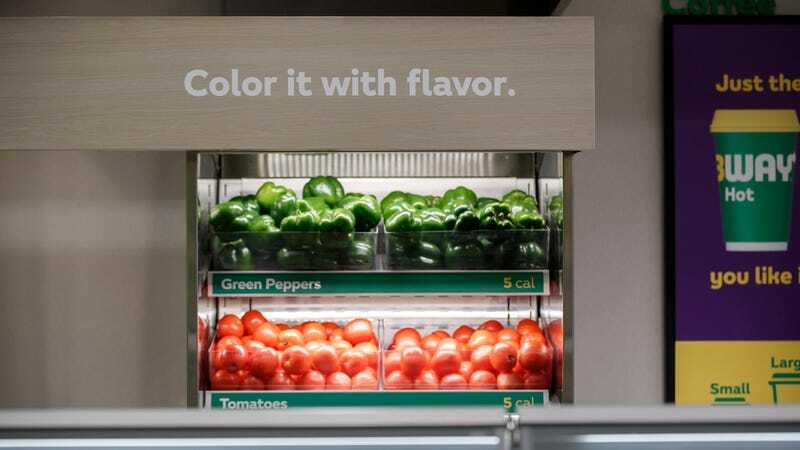 Subway calls it a “Choice Mark.” So presumably, you sit down with your laptop or phone, drink in the free internet all day long, while ordering sandwich after sandwich from an app and picking up your food by a damn kiosk where you can order more food. All the while, the Choice Mark looms over your choice-filled experience, celebrating a future free of face-to-face interactions. I don’t feel entirely hopeless. After all, the Subway redesign is still being tested and tweaked. And—as the Choice Mark logo suggests—you’ll also be able to choose how you experience Subway. The traditional Sandwich Artist experience with the counter and the meats and the veggies isn’t going entirely (for now), and you don’t have to use the smartphone app if you don’t want to. “Colour it with flavour” is a phrase that does not make sense. It’s the principle of the thing that gets me, though. Here goes another vestige of my ‘90s childhood, now corrupted and confused like the rest of this country and this planet. Maybe I’m being conservative, clinging to the past like this. Maybe, in the future, we’ll get all of our meals from apps and kiosks. Maybe we won’t even eat food any more, instead drawing our sustenance from daily transfusions of youthful blood. Maybe Richard Nixon’s head will be president. Anything is possible, I suppose, even bad things. 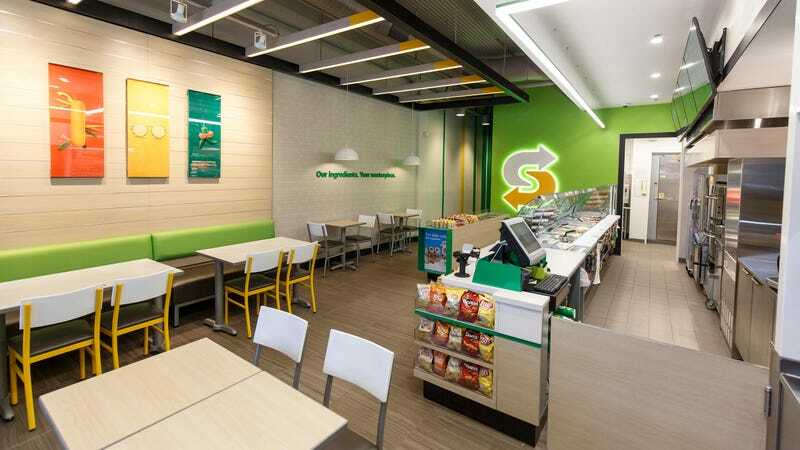 I want to give the new Subway design a chance and plan to do so next time I visit my hometown, Knoxville, where one of the demo restaurants is already up and running. In the meantime, I’m following that signature stink down to my local New York City Subway for one last Spicy Italian, a delicious sandwich that I will watch a human being construct with a limited but distinct sense of artistry. Better do it now, while I still can.